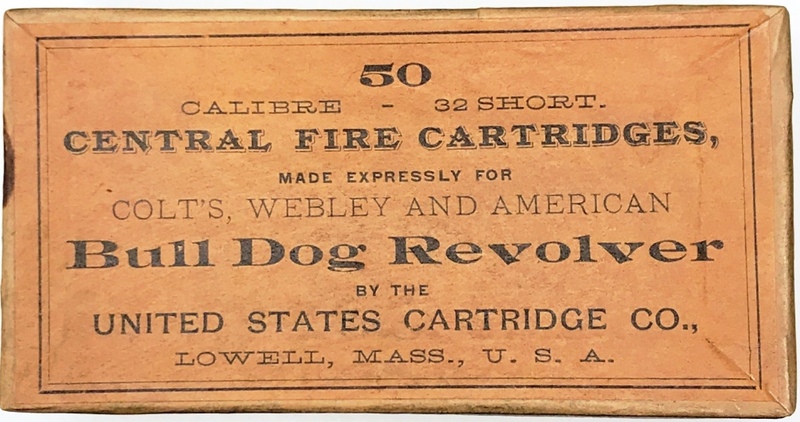 The photos below show an early United States Cartridge Company box labeled for ".32 Short Central Fire Cartridges Made Expressly for Colt's, Webley and American Bull Dog Revolver". The .32 Short referred to is the .32 Short Colt, which was introduced in 1875 by Colt for their New Line revolver. The .32 Short Colt was never a very popular cartridge, especially after the introduction of the .32 Smith & Wesson cartridge in 1878, which soon became the cartridge of choice among American and some European manufacturers of pocket revolvers. I believe this box dates from sometime in the late 1870s to 1880s, based on the early style fonts used on the label, especially the shadowing on the letters in the line that reads 'CENTRAL FIRE CARTRIDGES'. The use of 'calibre' and 'central fire' are early as well; by the 1890s, most ammunition manufacturers were using 'caliber' and 'center fire'. What sets this box apart from others is the lack of any indication that it was ever actually packed with cartridges for retail sale. Had it been, there would be soiling and circular imprints on the inside top and bottom from the heads and bullet tips of the cartridges, as well as staining from the grease that would have been in the bullet grooves. In addition, there would have been a side label or evidence of there having been a side label pasted around the box to seal the top half to the bottom. 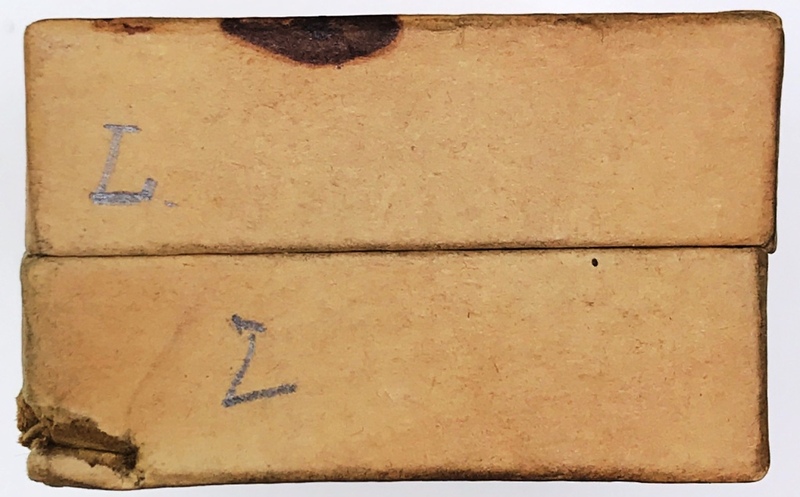 The top and bottom halves of one side of the box are marked with an 'L.' in black ink, as is one end of the box, but here a pencil was used rather than ink. This box was most likely repurposed for storing something in by someone at the U.S. Cartridge Company. The Winchester Repeating Arms Company is known to have maintained a 'reference collection' of cartridges and cartridge components, stored in unused, labeled cartridge boxes marked (usually in ink) on one end with what was contained in the box. The boxes used for this reference collection were most likely obsolete boxes that Winchester had on hand, and which they would have had no other use for. Shown below is one of these boxes that held samples of .35 S&W automatic pistol cartridges with full patched bullets made by Winchester. The October 11, 1913 date was probably when this box was added to the reference collection. I believe the U.S. Cartridge Company box shown at the start of this article came from a similar cartridge reference collection that was maintained by the U. S. Cartridge Company. I don't know what the 'L' represents, perhaps item L in a progression of at least 12 steps (A thru L) in a manufacturing process. 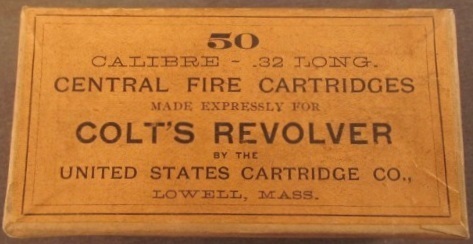 Shown here is a similar vintage box with an orange .32 Long Colt label that is pictured and described in the collector ammunition sale list on an on-line web site. This box is hand labeled in ink script on one side and one end 'Brass Cups 9/32 i.d 3/16 Long open both ends Order #349 July 31-1905'. 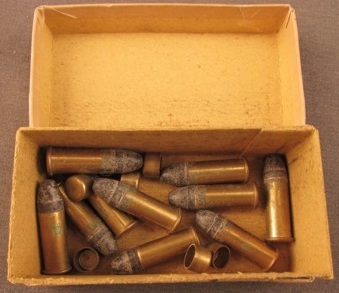 Inside the box are ten complete cartridges with a U.S. 32 COLT headstamp and six of the 'brass cups'. These appear to be cups formed in one stage of the draw process for the brass cartridge cases. 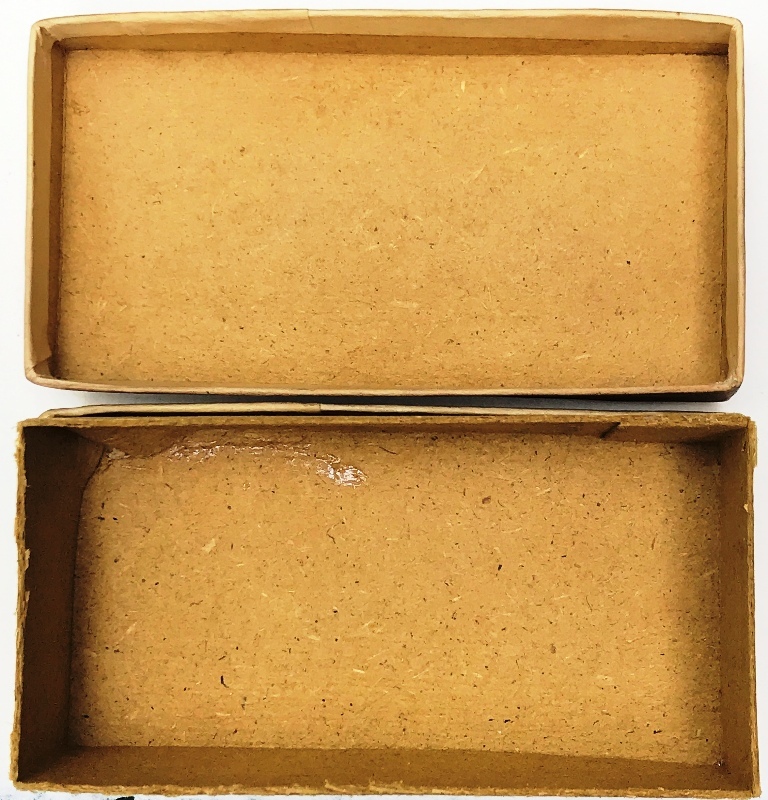 The inside of this box, like other reference collection boxes, is quite clean, showing no evidence of ever having held cartridges that were packaged for retail sale. 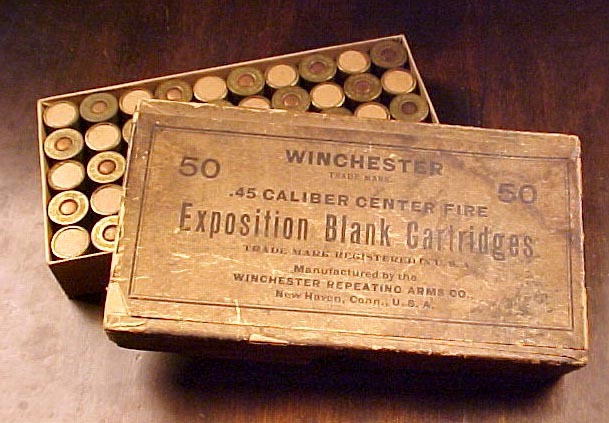 When I first encountered the U. S. Cartridge Company .32 Short Colt box, I had considered the possibility that it might have been a part of the Winchester reference collection, due in part to Winchester's association with the U. S. Cartridge Company (having acquired the assets of the company in 1926), and because Winchester's was the only reference collection that I was familiar with. 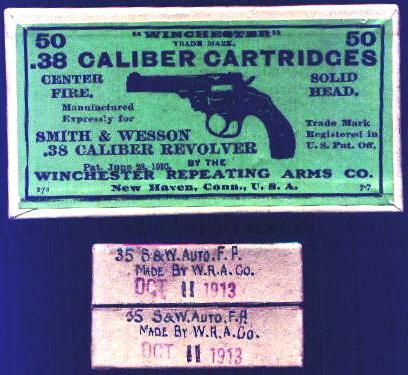 However, the July 31, 1905 date on the U. S. Cartridge Company .32 Long Colt box indicates that their reference collection was being maintained well before the Winchester acquisition.